September 2009: Absent from the story as recounted here has been the tale of how 2009 was a very odd time to be an American 2000 AD reader. It all worked out for the best, as Rebellion used the early, experimental launch of the Clickwheel service (which I'm still using) to test the waters for the comic's online delivery, but for several nebulous months, American readers who couldn't afford the upfront cost to splash out for a subscription had a choice about reading. They could either get digital progs about two weeks after UK subscribers got their copies in the post, or they could continue relying on Diamond Distributors to send copies to their comic book store. That's the path that I chose, and it did not work out so incredibly well. But before we step back, I do want to acknowledge that while there were growing pains, 2000 AD is, today, flatly and unquestionably the industry leader in same-day digital comics. This is especially notable because, last week, when Marvel Comics launched a huge promotion for several hundred free back issues on the comiXology platform, demand was so high that it crashed their servers. The American publishers do not yet allow people who "purchase" their comics to actually own them; rather, people rent them and can read them on a distant server. I don't know whether the comiXology crash was merely a few hours' inconvenience or the digital equivalent of a house fire, but people sure did act like it was the end of the world. Just a couple of days later, a service called J-Manga announced that it was shuttering. As Comic Book Resources reported on March 14, "After May 30, members no longer will be able to view the titles they’ve purchased." This would never have happened with the Galaxy's Greatest, because here, readers buy a comic, and download it, and keep it. I'm actually looking forward to getting to 2011 in this story, when I can start cropping images without laying old progs down on a flatbed and scanning them and the darn things never, ever lining up quite right. I'm a little incompetent in that regard. And, as we step back, I'd like to include one little bit of background to my knowledge base of 2000 AD in America that I may never have clarified: for almost a decade, I "worked" part-time (just a few hours a week) at the very best comic book store in the United States, where I had a regular order for 2000 AD for twenty years (1992-2011). I don't claim expert and exclusive knowledge into the inner workings of what went on between publisher, distributor, and retailer, but I am absolutely hotdamned certain that the endless delivery problems were not caused on the retailer level. Nor do I believe in any fashion that Rebellion - or for that matter Titan Books, who were also often victims of very late deliveries of product that I'd ordered - were incompetent enough to keep fumbling the shipments of their product. But I was present at that retailer for many, many occasions where the checkins of what was in the boxes from the distributor turned up missing titles, damaged goods, and, more than once, half-eaten snack foods crumbled and dropped atop the comic books. Now, it certainly might have been true, particularly in the 1990s when 2000 AD was published by Fleetway, that there were occasions when the publisher simply didn't ship enough comics to America to fill the distributors' orders. That was the explanation provided for occasional shortages, but it beggars belief that this could in any way be the publisher's fault. Why on Earth would Fleetway, and later Rebellion, when asked for two thousand copies, only send 1800? No, the system was flawed on the distributor's end: Diamond would simply not order enough. But when there was a shortage, what Diamond would apparently do, then, was first make sure that every shop that ordered multiple copies for their customers got at least one of them. Since, for a couple of years or so, I was the only customer at this shop that read 2000 AD (for shame! ), I'd get the short end of the stick when this happened. I didn't want to deal with it any longer, so I ordered two copies a month and found homes for the second copies. And this ensured that I did receive one of every issue, although hiccups sadly continued for quite some time. When I finally cut down to just one copy a month toward the end of 2008, I then got the awful "you've been shorted" news three times. Progs 1613 (November), 1627 (March) and 1634 (May) did not arrive at either my comic shop or my "backup," Criminal Records in Atlanta, which used to order one copy of each for their shelves. That's right, the same issues didn't show up at two different stores. And then came the summer of the polybags, which meant that a shortage didn't mean you missed a single issue; it meant that you missed FOUR. Now, I chalked up the change from twice-monthly shipping of two issues every other Wednesday to once-monthly shipping of four or five issues in a bag to a desire to repair Diamond's decade-plus of shipping incompetence, but this was said to not be entirely true. Earlier in 2009, Diamond made the sensible decision to quit carrying guaranteed-unprofitable items. We didn't like it, but we understood it. For many years, the distributor would pretty much stock and ship anything that looked like it might appeal to geeks. This resulted in a massive monthly catalog for retailers to make their regular preorders. For many, this was a time-consuming chore, because most retailers stick with ordering the tried-and-true big sellers from Marvel and DC and Dark Horse. The big change came in the summer, and I believe that it came in two tiers: if orders for a product failed to meet a higher minimum threshold, then Diamond would not purchase the product from the publisher. If the publisher couldn't reach that higher minimum threshold across the line, then the publisher got dropped. You could probably Google for more information and specifics about this. Since 2000 AD was right on the bubble, Diamond came up with an idea to keep it profitable: polybag several issues and treat four/five of them as a single monthly product. That way, it would be quicker to handle, I guess, and less easy to lose? It made internal inventory easier? Computer records simpler? Whatever; it was said to work for them, except that it did not for us. The wheels went off instantly. In the July 2009 issue of Previews (in stores in June), Diamond solicited "2000 AD September Pack," with issues 1651-1655. This, as its name implies, should have been in shops sometime in September. Sadly, Diamond doesn't keep public archives that far back, but I can say with about 99% certainty that these issues were listed on the "arriving this week" announcement PDF in late October. So they're already thirty days behind. And yet they were not shipped (to Atlanta) on the date promised. The next four weeks went by. No progs. 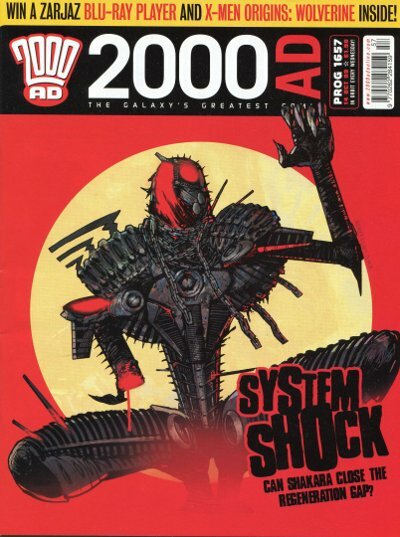 On Monday, November 23, 2009, the "2000 AD October Pack" (1656-59) was listed as arriving in shops 11/25/09. On that day, Atlanta shops received the "September Pack" of 1651-55, two months late. The "October Pack" arrived on December 16. And it was weirder and weirder depending on where you lived. I was in regular correspondence with several fans and retailers around the country at the time, researching this problem. While neither my shop nor Criminal had received progs 1613, 1627, or 1634, shops in other cities did. In Boston, where I had visited earlier in the summer, I found 1613 at Million Year Picnic and 1627 at Hub Comics. Meanwhile, in Chicago, the prog packs were coming four weeks late, and not eight like in Atlanta. I still don't have a hard copy of 1634; it is the first issue since 1208 that I don't own a physical copy. But there are more holes to come. There's the "May 2010 Prog Pack" of issues 1682-1686. That never arrived in Georgia stores at all. Of course, by then, I'd found a solution. Starting with Prog 2010, I started buying the comic from Clickwheel regularly, and if the hard copies arrived, I treated them like extras. I was aggravated - hell, 1685 should be framed - and, eventually, I got tired of the aggravation. Later in 2011, I sent word that I was, with regrets, finally ending my subscriptions entirely. The economy had stunk for ages and money was tight anyway, and the comic shop was an awfully long drive away. I saved a lot of money just sticking with my nice weekly purchase. It's available about 6 am every Wednesday morning, and I can read it while I eat breakfast. Pictured up above to break this wall of text is Lucifer from Necrophim by Tony Lee and Lee Carter. It's by leagues the best of Tony Lee's stories for 2000 AD, even if you can't help but wish that the protagonist Uriel would have come up with a slightly less convoluted plan to destroy Lucifer and rule Hell, one that doesn't involve telling slightly different stories to eight other characters and keeping them at odds with each other. I seem to have enjoyed Necrophim, which was published as one 26-part serial across three stories (1628-1723), more than many readers. The second chunk of this complex serial was published during this awful period with the two-month delays and it reads much, much better without all the chaos and confusion that surrounded delivery of the comic at this time. Re-emphasizing again, for anybody Googling through: you do not need to worry about this nonsense these days. Just buy the comic online from the shop for your laptop or your iPad or similar device every Wednesday. There are no problems with it at all anymore, and you can collect truckloads of back issues for your hard drive. Same day delivery: it just makes sense! Next time... well, it'll be a few weeks. Time for another short break from all these walls of text and scanning to talk about some recent collections and stories over at my Bookshelf blog. Thrillpowered Thursday will be back on April 18! Tell your friends! The ongoing Diamond 2000AD distribution saga never ceases to baffle me. 2000AD has been appearing in stores here in NZ - on the other side of the world from the UK) like clockwork, every week since 1977, albeit 8 weeks after the UK. This year I even received Prog 1813 the week after Prog 2013 (but there was no Prog last week, so there may well be two more weeks of no issues yet). However, when I was living in Asia and the only way to get for me to get 2000AD was via Mile High Comics and Diamond, I missed several issues. I had to e-mail my parents back in NZ and tell them to pick up an issue when it appeared in NZ - I finally gave up on MHC and Diamond and just got my parents to buy them for me each week, so I'd have a massive pile to read whenever I returned home.